Very Large size compresses up to 25%. Carton Packing: 15 pieces/carton, 30 lbs, 24x19x76 inch size). 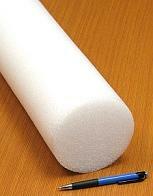 3 INCH DIAMETER POLY BACKER ROD, CLOSED CELL, NON-STICK SKIN, 6-FOOT LENGTH/PIECE (actual length about 69 inches). PRICE/PIECE. (color could be white, gray or charcoal and is not selectable).